Rand Paul Bids To Loosen Democratic Hold On African-American Vote : It's All Politics Sen. Rand Paul of Kentucky, a top 2016 GOP presidential prospect, is stirring curiosity among black leaders for his outreach efforts and activism in reforming mandatory sentencing laws. 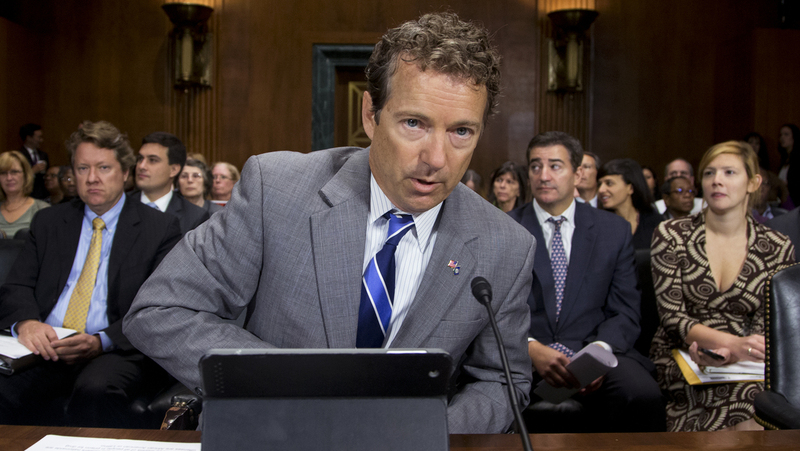 Republican Sen. Rand Paul of Kentucky testified last year in favor of revamping the nation's mandatory federal minimum sentencing laws. For more than a year, GOP Sen. Rand Paul has been staking out positions on issues that resonate in the black community, including school choice and prison sentencing reform. And he's been showing up in some unexpected — for a Republican — venues, including historically black colleges. It's stirred an unusual degree of curiosity about the freshman Kentucky senator — and 2016 GOP presidential prospect — among the Democratic Party's most reliable voting bloc. "He's a different voice in the arena that we don't traditionally hear," says Lorraine Miller, acting head of the NAACP, who expects to invite Paul to speak at the organization's July national conference in Las Vegas. "He's an engaging guy — that's why we want to talk to him," Miller says. Miller is not the only black leader who has been intrigued by Paul, whose father, former Texas Rep. Ron Paul, had three unsuccessful presidential runs and amassed a fervent Libertarian following. Miller's predecessor, Benjamin Jealous, has previously hailed Paul's position on reforming drug and sentencing laws, which disproportionately affect African-American individuals and families. And Jealous has pointedly noted that while an NAACP poll last year showed that a majority of African-Americans believe that Republicans "don't care at all about civil rights," about 14 percent indicated they would vote for a GOP candidate if he or she were committed to civil rights. Democrats have little worry about maintaining their vise-like grip on the African-American vote come 2016 — since 1964, no Democratic presidential candidate has gotten less than 82 percent of the black vote. But Paul is speaking both directly and indirectly to black voters in a way the community hasn't seen in decades from a prospective GOP presidential candidate. "He's done what most conventional Republicans would be too fearful to do — dive into situations that would make them uncomfortable," says Ron Christie, an African-American lawyer and GOP commentator who worked in the George W. Bush administration. "I find it fascinating that he has gone into communities where Republicans typically don't connect, and don't listen," Christie says. Paul went into those communities with some baggage. After winning Kentucky's GOP Senate primary in 2010, he said in an interview on MSNBC that he believed, as a proponent of limited government, that private businesses should not be forced to adhere to the nation's civil rights law. As criticism rained down, Paul quickly shifted gears, issuing a statement that said he supports the Civil Rights Act because, "I overwhelmingly agree with the intent of the legislation, which was to stop discrimination in the public sphere and halt the abhorrent practice of segregation and Jim Crow laws." It was just over a year ago that Paul made a much-ballyhooed appearance at Howard University, one of the nation's top historically black colleges. His speech included a few stumbles — he drew groans when he asked those in the packed auditorium if they knew that black Republicans founded the NAACP. But Paul also elicited applause when he said that the nation has drug laws and court systems that "disproportionately [punish] the black community." Miller, the NAACP chief, and other African-American leaders refer to the issue as "mass incarceration," and its prominence as an issue in the black community can't be understated. "I've been traveling and talking to audiences about the effect of mass incarceration," Miller says. "There is hardly a person who hasn't been affected by it; what we do about it is the question." "It is such a pervasive issue in our community, and, quite honestly, if we can get the ear of someone like Rand Paul, that helps us in trying to find solutions that make sense," she says. Since that speech, Paul has — along with Democratic Sen. Patrick Leahy of Vermont — led legislative efforts on Capitol Hill to revamp mandatory sentencing laws. Paul has likened the effects of such laws on black Americans to the racist policies of the nation's Jim Crow era, and has said that laws preventing felons from voting is tantamount to voter suppression. In testimony before the Senate Judiciary Committee last year, Paul said this: "If I told you that 1 out of 3 African-American males is forbidden by law from voting, you might think I was talking about Jim Crow 50 years ago. Yet today, a third of African-American males are still prevented from voting because of the war on drugs." "The majority of illegal drug users and dealers nationwide are white," he said, "but three-fourths of all people in prison for drug offenses are African-American or Latino." Paul has since promoted in Detroit what he calls his "Economic Freedom Zone" plan, which would lower taxes in economically devastated areas like the Michigan city. He spoke at Simmons College in Louisville for the historically black institution's biblical higher education accreditation event. He recently criticized the Obama administration's record on domestic surveillance, pointedly invoking the government's snooping on the Rev. Martin Luther King Jr. as an example of the perniciousness of the practice. And this week, he's speaking in Chicago and Milwaukee about school choice and his support for vouchers. In anticipation of the trip, he posted last week on Twitter a video of an African-American teenager's struggle to seek an education better than one offered in her poor South Side Chicago neighborhood. Brian Doherty, who chronicled Ron Paul's rise in the book Ron Paul's rEVOLution: The Man and the Movement He Inspired, says it is too early to tell how or whether the younger Paul's efforts will resonate with the "new coalitions" he's trying to build. Paul is also courting young voters — another demographic Democrats dominate — by highlighting his opposition to government surveillance programs. "Rand Paul is openly attempting some fresh policy entrepreneurship with the Republican Party," Doherty says, "trying to appeal to big and important constituent groups where the party pretty much has nowhere to go but up." "So anything he can do that's both true to his party's supposed dedication to liberty and constitutionally limited government — and appeal to a classic American sense of self-reliance and self-help — isn't likely to hurt," says Doherty, a senior editor at the libertarian publication Reason, "even if we can't be sure it's going to work in a big way." In the meantime, says Christie, the former Bush staffer, Paul has "shaken up what purports to be conventional wisdom and thinking in targeting voters." Those voters aren't a monolith, and, like most, aren't typically single-issue voters, says the NAACP's Miller. "This issue, sentencing and mass incarceration, doesn't make him the civil rights Republican candidate, in my humble opinion," she says. "But we're in no position not to hear from other voices out there in the public venue." "Let's talk," she says. "People are rational and can make up their own minds about whether he's selling wolf tickets, or really has something we can work with."